This time next week it will all be over in the award season celebrating Michael's wins and nomination for his portrayal of Bobby Sands in Hunger. I did a quick web search for weekend updates on Michael, and I found just a few crumbs to tie us over for a few days. For starters, this Wednesday, February 4th, the 29th Annual London Critics Circle Awards will announce the winners, and Michael is up for Best Actor. And on Sunday, the 8th, the BAFTAs will announce this year's winner of their Orange Rising Star Award. Mind, if you have not voted for Michael yet, you have up til midday on the 4th to vote for him - you must live in the UK to vote. 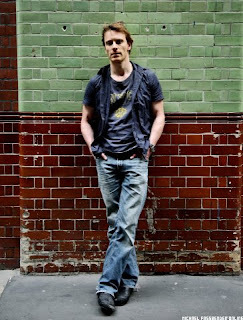 "Michael Fassbender has a relatively short career, but even early on there's some big surprises in terms of project titles that he's starred in. Look to current days and you can see that there's a huge potential for his career to explode, and it looks like he's just on the cusp of that happening. The Orange British Academy Film Awards, aka the BAFTA's, have an award where the public can vote for the winner, and this year Filmstalker is looking through the nominees and the next one we're looking at is Michael Fassbender. It's all part of the lead up for Filmstalker's first BAFTA visit, and hopefully not the last." Go check out the blog to read the rest of the article about Michael. And over at the Gossip Rocks forums, at my thread dedicated to Michael in the 'Hot Guys' section, I updated it with the Crash magazine photo shoot. The thread got a few more hits, but one person added, "Saw him in Hex. Mmmmmm! Evil never looked so good"! I couldn't agree more. I got my fingers crossed for me and Michael this week! It is so great to hear nice things about him from other sources. Do you have BBCA? The BAFTAS air on Sunday at 8pm. No, I don't have BBCA, I cut the umblical cord to The Man(cable) over two years ago. I do miss BBCA terribly though. Too bad I just can't subscribe to that network.